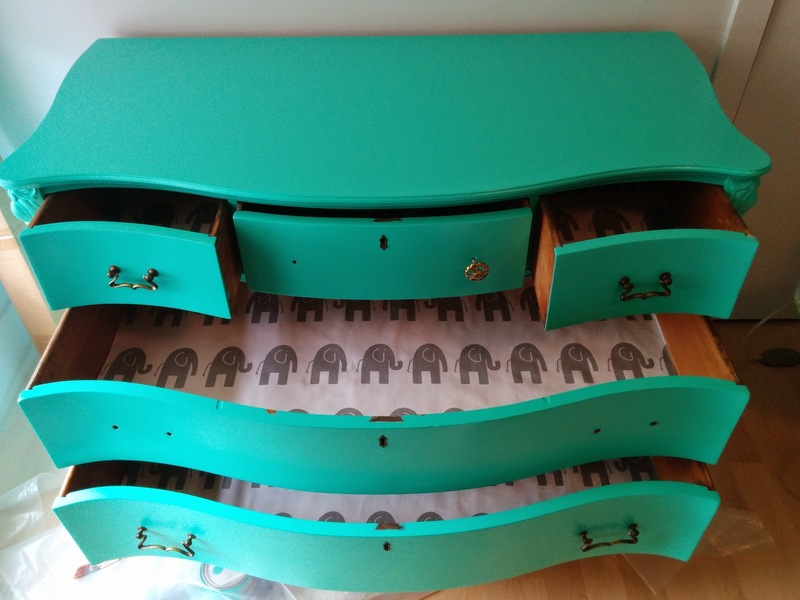 I refinished my grandmother's dresser for the nursery, but being completely handmade and 100 years old, the bottom of the drawers wasn't very smooth for storing clothing. Hence these lovely liners! 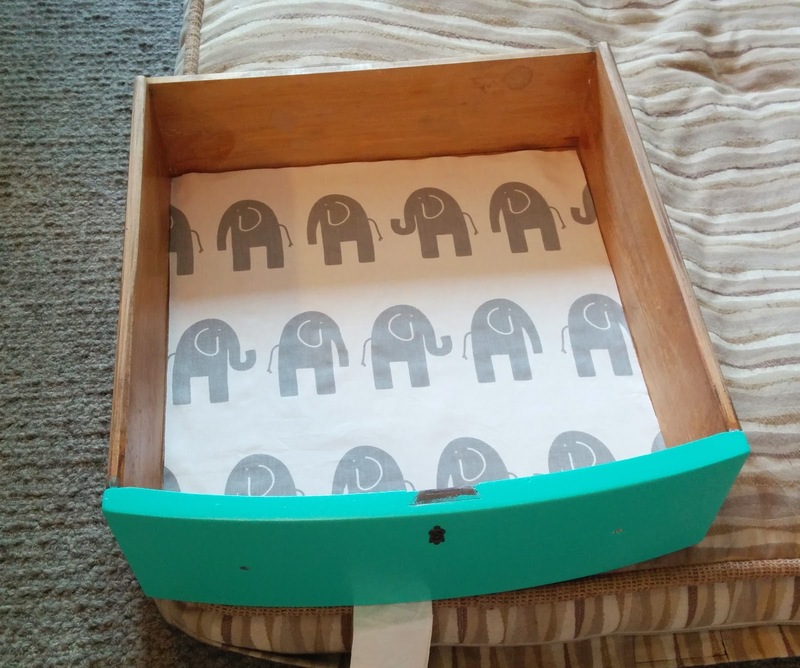 There are various ways of making liners, I selected this one because it didn't require the liners to be glued to the bottom of each drawer in order for the liners to stay in place. This tutorial was my inspiration -- you should take a look at it for additional pictures of the stiffening step! 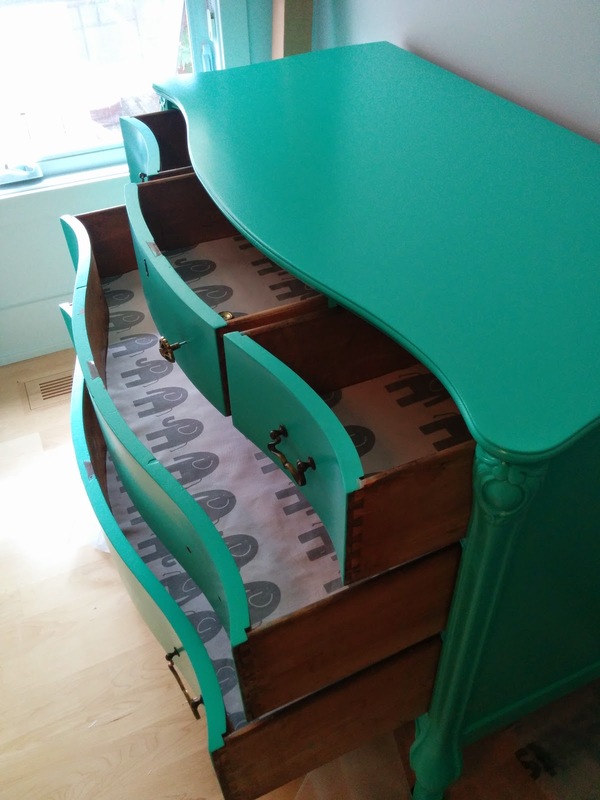 This dresser has two small drawers, one medium one and two very large ones. Each drawer is curved uniquely. I decided to create templates for each type, but ensured not to follow it too closely to allow for variation between the drawers. 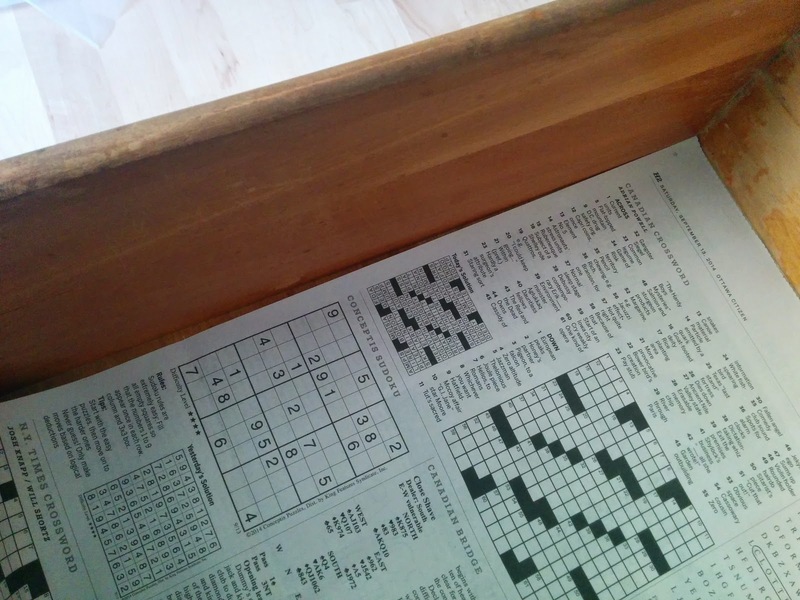 Using newspaper, line up a square edge with the back and side of the drawer as best you can. In my case, the corner of the drawer wasn't square, so I pushed it into the corner using a fingernail and then used an exacto to cut along the seam. For a small drawer, just press the opposite side edge of the newspaper in with a fingernail then trim with an exacto or scissors. If the drawer is larger than a single sheet of newspaper, take a second piece of newspaper and repeat the above for the other back corner, than tape the two together in the middle after lining up the side edges. At this point, you should have a large rectangular base. 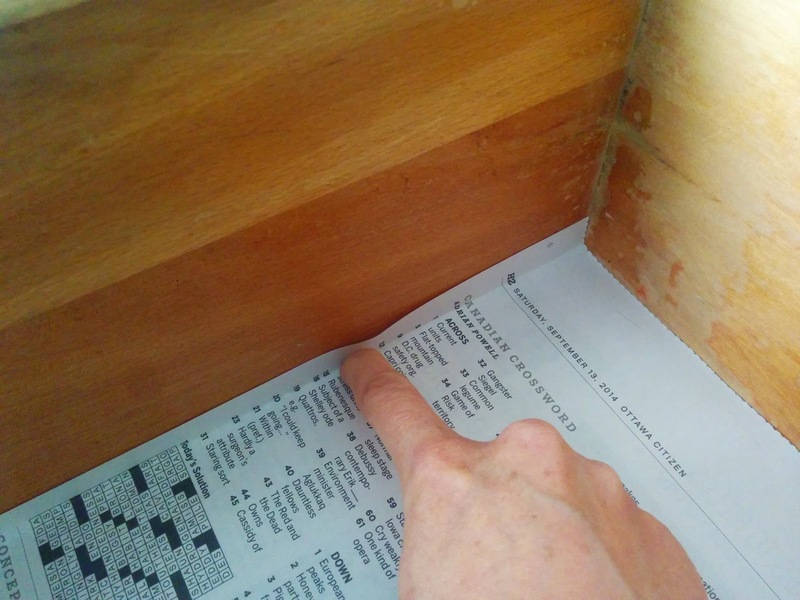 Making sure the back two corners of the newspaper are nicely aligned to the inside back of the drawer, use a pencil and your nails to press the paper into the front of the drawer to trace out the shape. Once traced, cut to measure. I recommend leaving a little extra as you cut, its easier to remove than to add. Test it out inside the drawer and trim until it fits. Using the templates you've created, cut rectangular pieces of fabric to just barely fit the template. Make sure to cut enough for all of the drawers, in my case I ended up with 5 rectangles. Set yourself up in an easy to wipe down and well ventilated area, with rags ready to wipe up any mess. Ideally, if you have a clothes line, you'll want to do this step outside. I did it in our spare washroom, with hangers and pins lined up above the bathtub ready to hang each piece of fabric. Mix equal parts water and stiffener in a large bowl. Note: The bottle says to use only stiffener and to brush it on, but I followed Nalle's advice on this one. One liner at a time, place the full amount of fabric in the bowl and ensure its fully submerged. I didn't fold it neatly because it didn't fit in the bowl I was using. Rinse the liner, trying to ring out as much of the water and stiffener as possible, while also smoothing out the fabric to prevent it from stiffening. Hang it or lay it flat to dry. If you hang these, you may find the top dries faster then the bottom, so you might want to rotate them half way through dying to ensure even drying speed of the entire liner. Before any part of the fabric is completely dry, iron the liner! I actually waited a little too long on a couple and as a result there are a few spots I couldn't iron completely flat. Tip: I placed an old pillow case on the ironing board to protect the ironing board cover just in case. Hang it back up to dry, perhaps rotating it again to ensure even drying. For the smaller liners, I laid them flat at this point. Notice below that one edge is dryer and more wavy than the other, that's from originally hanging it to dry which doesn't allow for even dying speed. You now have large stiff rectangles of fabric to trim down to size. Using the correct newspaper template you created, carefully cut out the fabric with a sharp pair of scissors. Make sure the right side is up on both the template and liner! On the curved edge, you might want to allow for a bit of extra, as I found my templates to be imperfect, and each drawer to be slightly unique. Iron one last time before finally placing in the drawer. I simply love the extra pop these give against the bright colour of the dresser. Fabric. 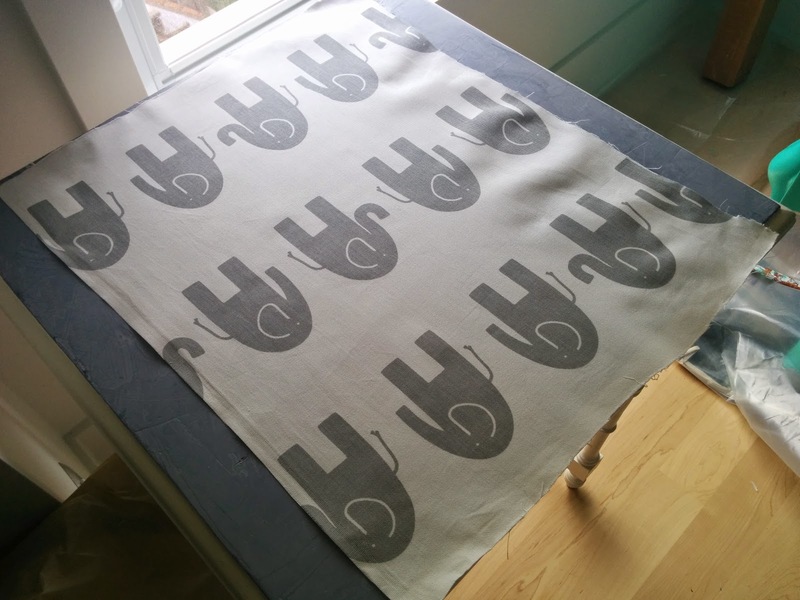 I used Premier Prints Elephant Twill White/Storm. Mod Podge Fabric Stiffener. I was able to find it at Michaels. Thank you for the inspiration Anu! Awesome blog with photo. I hope your post will helpful for others. I have a similar post on triple stroller for baby and twins baby monitor you may like. Thanks.